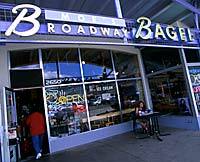 Serving the best bagels west of Manhattans West Side, Moes merits its status as a Boulder institution. Moes kitchen churns out a broad variety of bagels throughout the day, from pumpkin to pumpernickel. All sorts of spreads, a variety of coffees, tall bagel sandwiches and a relaxed atmosphere make this more than just a breakfast bagel joint. Located across from Boulder Community Hospital, Moes makes bagels the way they should be made, with a firm exterior and a chewy, flavorful interior. Open at 6 a.m. seven days a week.